We take pride in building lasting relationships with our patients, which is why we take the time to get to know you, your vision requirements and your lifestyle needs. Our mission: to provide quality vision care to the people of Southeast Colorado. 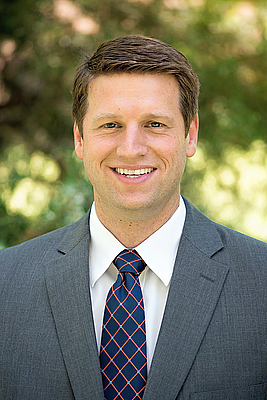 Dr. Ballantyne and Dr. McConkie, enjoy getting to know each patient and they carefully craft each vision prescription to meet your personal and occupational needs. 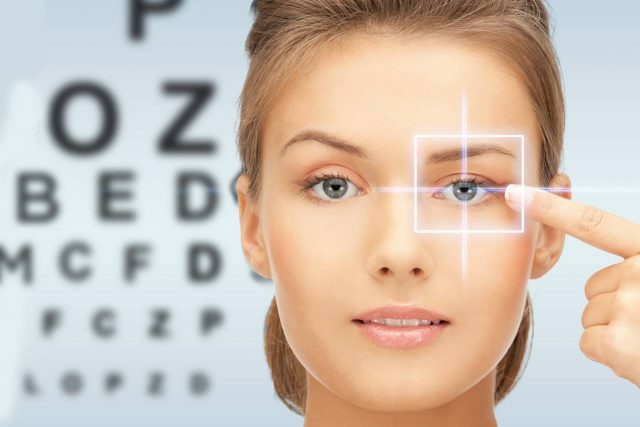 At Ballantyne Vision Care we accept new patients of any age. We recommend getting your first eye exam between the ages of 6 and 12 months. At this critical time of vision development, we can rule out potential problems early on. Dr. Ballantyne is an Infant See provider, meaning that he will examine infants between the ages of 6 and 12 months for free! We treat our patients like family and take care of them as we would like to be taken care of ourselves. We have a modern office with all the latest digital technology. What separates us from the rest is our knowledgeable, helpful, personable doctors and staff who are committed to doing everything in their power to make your experience perfect. 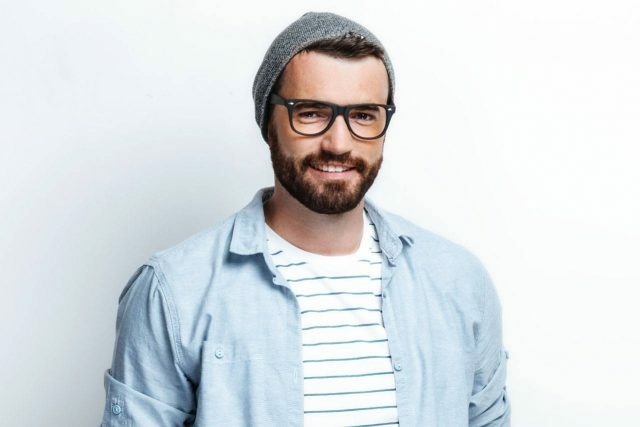 We carry the latest European and American designer eyewear collections in a variety of styles, colors, and materials. 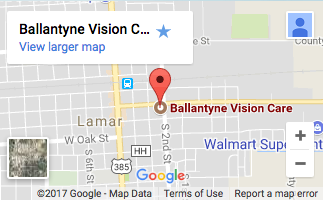 Our comprehensive eye exams are thorough and accurate because Dr. Ballantyne takes the time needed with each patient for each exam. We specialize in vision exams, pediatric exams, binocular vision, hard to fit lenses including sclerals and lots of frame brands. We have special testing equipment to diagnose glaucoma, too. Our personal touch sets us apart from the others. 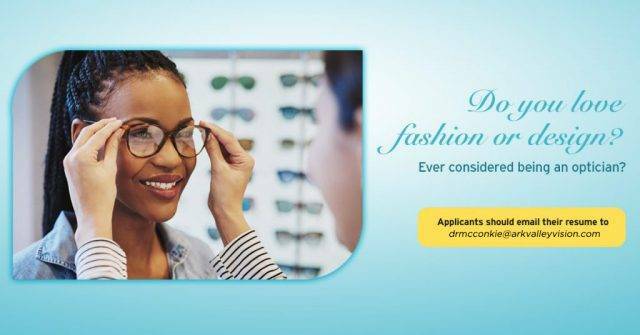 Our exams are very thorough and our recommendations in the optical help our patients see their best and look their best. Come to us and see the difference! 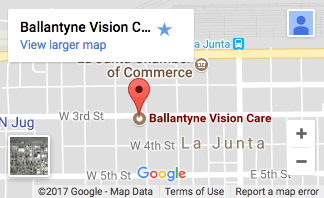 With offices in La Junta and Lamar, Ballantyne Vision Care serves southeastern Colorado – schedule an appointment today. Ballantyne Vision Care offers emergency services that require immediate and urgent eye care. If your eye is injured, don’t try to judge the severity of it. Immediately seek the opinion of an eye doctor to lessen the risk of hurting your vision. We understand ocular emergencies can arise at any time. Please call our office number: (719) 383-0134 for further instructions. Use your best judgment on urgency, if you feel your need to find the nearest emergency room. Three key differences in the scleral lens technology? The lens doesn’t touch the cornea but rests on the sclera or the white part of the eye to increase comfort. Microscopic adjustments to the lenses can be made to customize the fit of each lens to each patient’s unique needs. 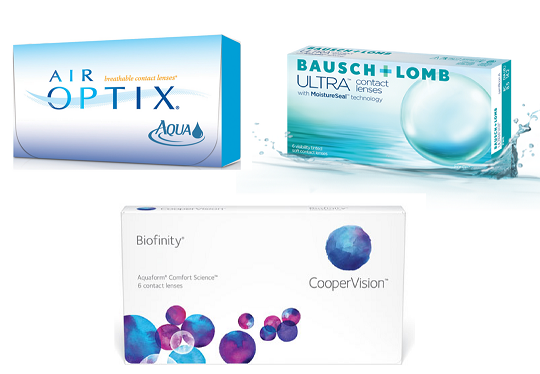 Bausch + Lomb ULTRA contact lenses with MoistureSeal® technology helps prevent lens dehydration that may be caused by reduced blink rates. Spending more time on digital devices may mean you are less satisfied with your contact lenses. AIR OPTIX AQUA breathable contact lenses allow up to 5 times more oxygen through the lens than traditional soft contact lenses. More oxygen provides for healthier eyes and more comfortable wear. Discover comfortable all day wear that can last as long as one month. 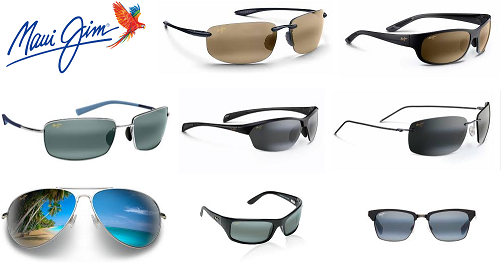 Match Your Maui Jims With Your Style ! Inspired by the beauty and culture. Very through , professional, and an expertise I'd expected for my annual exam. Nice staff, nice office setting. I was seen by Dr. BALLANTYNE himself yesterday. I had a great experience. Super nice, down to earth and explained everything great! I would definitely recommend him to anyone! Dr. Ballantyne & his staff offered friendly attentive service for my annual eye exams and a wide variety of frames for my glasses- excellent experience!! I highly recommend this business! Every single person was helpful, from holding my crying infant while I had my eyes checked, to helping me find the perfect new pair of frames. I had a small issue with my insurance, and they were extremely patient while I worked through it with the insurance company. What would have been a stressful appointment for me, wasn’t because the office staff was so great. 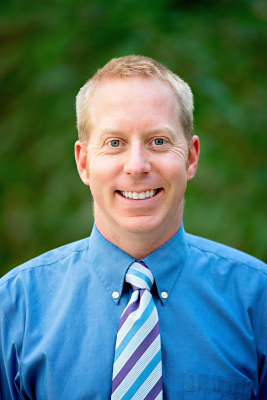 Dr.Ballentyne is very thorough with his exams and he actually listens to his patients concerns. He had trained his staff well to be professional in their jobs as well as kind.